My mom, Marcel and I (Joel) usually bird together, but yesterday (Jan. 19, 2009) it was just Mom and me. 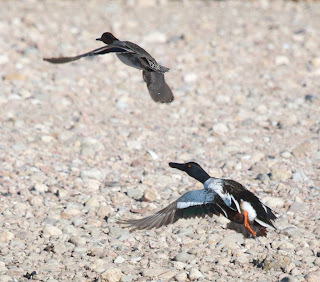 Our destination was 88th and the South Platte River where we hoped to see Barrow's Goldeneye. On the way there we saw three Red-tailed Hawks, two Bald Eagles, and one Northern Harrier on Weld County Rd 32.5 west of the S. Platte River. We stopped to photograph the soaring raptors. 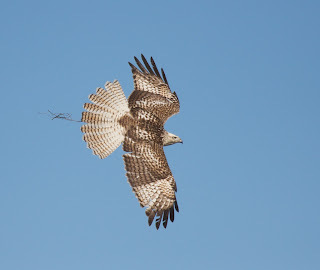 I got nice photographs of an interesting juvenile Red-tailed Hawk with a rodent and some pulled up grass in its talons!! UPDATE (21 Jan 2009): I initially thought this was a Krider's and then after doing some web research, I was thinking Harlan's. Then Bill Schmoker looked at it and it looks like there is more research to do on this bird. I will post another update when I know more. FINAL UPDATE (22 Jan 2009)!!!! 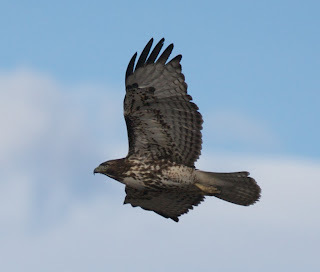 This bird is agreed by Brian Wheeler, Tony Leukering, and Jerry Ligouri to be a Krider's Red-tailed Hawk, which is a great bird for our state!!! When we were almost to our South Platte destination, I saw a big white bird in a small pond. We turned around, found a safe spot to park, and checked to see if it was a swan. 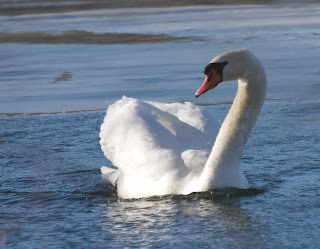 It was a Mute Swan, but I don't know if it is wild or not. My Aunt Diane met up with us at the South Platte and we headed upstream towards the blue and white water tank. That is where the Barrow's Goldeneyes are often seen. There were tons of Northern Shovelers, dozens of Northern Pintails and Gadwalls, a few Green-winged Teals, and a Northern Harrier spooking up all the ducks! A big white bird flew up from the river. At first I thought it was a Great Egret, but then quickly realized it was a gull ... a very large gull! 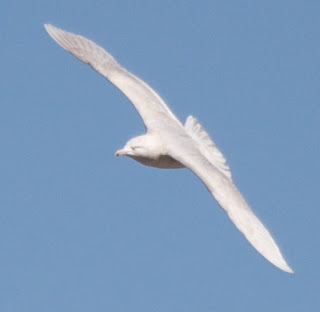 My mom and I got some photos, and I believe that it is a Glaucous Gull! 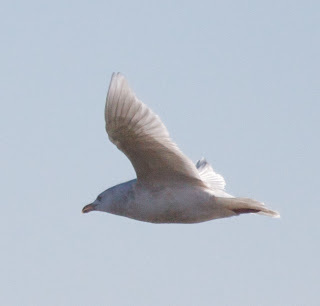 Update: Bill Schmoker confirms the Glaucous Gull ID. When we got to the water tank, I spotted two male and two female Barrow's Goldeneyes! Near the Barrow's Goldeneyes there were lots of American Coots and one female Bufflehead! 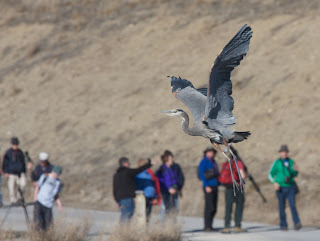 On Saturday, January the 17th, we attended one of the biggest bird walks in the nation, Valmont Reservoir. Made up of three large lakes located just outside of Boulder, Colorado, the complex is a premier winter hot spot. What makes this such a great birding location? The lakes are actually cooling ponds for the adjacent coal-fired power plant, Xcel Energy's Valmont Generating Station. Therefore they are essentially heated, and don't freeze when all of the other local lakes do, thus making it a magnet for wintering ducks, geese, and gulls. Generally the closest viewing of these private lakes is from two nearby hills, but you need a powerful spotting scope to get a decent look at the two closest bodies of waters. It is almost impossible to identify individual species on the farthest reservoir. But once a year the Boulder Bird Club gets permission to lead a bird walk inside the property. This year there were over one-hundred participants, clear skies, and warm temperatures. The previous two years we have attended it has been overcast and bone-numbing cold, making for prime birding conditions. But because of the surprisingly warm weather this week, this year's trip wasn't the best for birds, but it was still very good and comfortable. As always, the crowd was split up into smaller groups, each having an expert birder as a guide. The leaders were Ted Floyd, Bill Schmoker, Bill Kaempfer, and Christian Nunes. Another key figure is Dave Madonna, Valmont's Plant Engineer, who is responsible for making this trip happen every year. We went with Bill Schmoker's group and enjoyed his insightful commentary. One of the biggest highlights was an adult Mew Gull, found by Ted Floyd's group. This year on New Year's Day, we got up at the crack of dawn to see the first birds of the year. Our first birds were different ... an American Robin for Joel and a Pine Siskin for Marcel. After seeing 14 common bird species around our house, we headed out towards Boulder. We took our dad to see the White-winged Scoter at Thomas Reservoir and saw it. 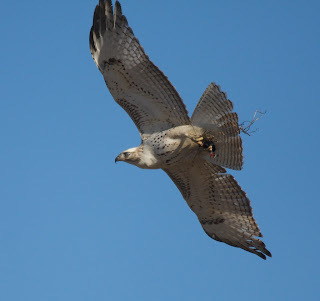 There were also Canada Geese, a pair of Mallards, Ring-billed Gulls, 2 Herring Gulls, and 2 Red-tailed Hawks. We also checked out the Valmont Reservoir Complex.